There is certain prescription related information that you need to know before placing an order for your contact lenses at Contact Lenses Express. What and where are your contact lens prescription details? The prescription details will be mentioned on the contact lens packaging along with a series of numbers. These numbers are your "Contact Lens Prescription Numbers". On the box there isn't any specified mention as to which one is for the Right eye or the Left eye. Hence you need to remember or make a note of the power for each of eye separately. When filling in the information for your online order you will need to be accurate with the details since questions depending on the lens parameters have to be completed without any mistake. 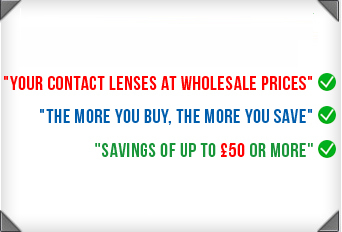 Some lenses will already have the Diameter and Base Curve pre-filled as they are standard for that brand. If you wear lenses with astigmatism, then there will be a need for you to have an additional set of figures to enter when placing your order online. BC - The base curve (BC) is a part of your contact lens prescription. It relates to the curvature of your eye and typically is a measurement in the range 8.0 to 9.5. Your Optician measures the curvature of your eye during your contact lens exam and chooses the base curve for your contacts appropriately. PWR - the strength of lenses in order for sharper sight. CYL - "Cylinder" is a measurement of astigmatism. The cylinder number shows just how oval the eye is. If the cylinder number is positive, it means the person is far sighted. A minus sign means they're near sighted. AXIS - communicates where the cylinder needs to be in order to correct the astigmatism. BRAND - the make and manufacturer of your contact lenses.